Sim-S.N.E.X. (The Super Nintendo Emulation eXtreme) is a simple snes emulator that detects information on the rom, and features a debugger. 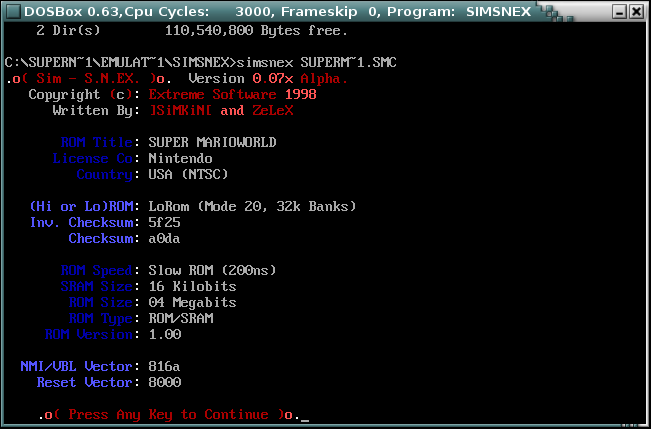 It was written in assembler by |SiMKiN| and ZeLeX in 1998. It never advanced very far, and it did not display graphics. Four versions of the emulator were released, 0.04, 0.05d, 0.06d, and 0.07x. It is unknown why it was discontinued. The homepage is still up, and can be found here (be warned, this site caused my browser to completely grind to a halt).